Hem manufacturers of Precious Chandan and a very special range of incense sticks welcomes you to experience a bliss of a spiritual order. Each and every product is indeed a summary of the great tradition that includes self control and makes all your meditative and spiritual trips smooth. Hem Corporation was established in 1981, with a large capacity manufacturing set up in Mumbai (Bombay) & Bangalore India. 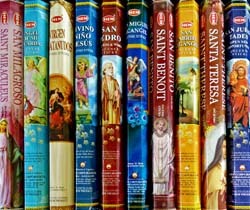 We now feature their 8 stick, 20 stick hex, 16" tall sticks, scents of nature and the intriguing flora masala.